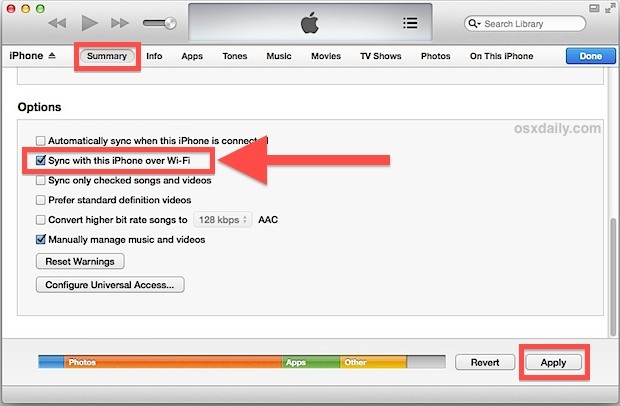 If you want to be able to transfer music to an iPhone, iPad, or iPod touch wirelessly and without syncing everything on the device with iTunes, you’ll need to turn on iTunes Wi-Fi Sync. Yes, you read that correctly, in order to add a song to an iPhone (iPod, etc) wirelessly and without syncing the entire device, you have to enable a feature that suggests kind of the opposite. This is very easy to do, but surprisingly, wi-fi syncing is disabled by default. We’ll walk you through turning the feature on and then showing you how to copy a song over to an iOS device wirelessly, without syncing everything else which as we all know can take forever. This process will be identical for Mac OS X and Windows PC’s. Now that wi-fi communication between the computer and iOS device is enabled, you can disconnect the iPhone/iPad/iPod from the computer by unplugging it and you won’t have to plug it in again unless you want to manually backup or transfer photos, HD video, or music from it. Now the only requirement is the iOS device is within wi-fi range of the computer with iTunes. This is also going to be easiest when you have the sidebar enabled, in iTunes 11+ you can choose “Show Sidebar” from the View menu. Transferring wirelessly is going to be a bit slower than through the USB cable, but that’s a small price to pay for the convenience of not having to drag a cable around everywhere and connect it to an iPod and Mac every time you just want to add a new song you just downloaded. Keep in mind that music bought from iTunes should sync automatically if you have that enabled, but you’ll be able to use this drag & drop method whether or not you do. Considering this is by far the easiest way to transfer music, videos, media, and sync a device in general, it’s a little strange that it’s not always enabled by default. Take the time to enable it though, you’ll be happy you did. Android allows you to download your MP3 from Google Drive or wifi transfer via airdroid drag and drop. Jonny Ive please do the same for ios7. Tom, ios6 icloud match the same thing? The “Sync this device over Wi-Fi” setting is not available for my iPad. Ok, I have probably stupid question, but after I enabled the option and unplugged the Iphone it dissapeared from the side bar. Is the cord necessary? It is sync over WiFi after all. The cord is not necessary, though the device will disappear initially when you unplug it. 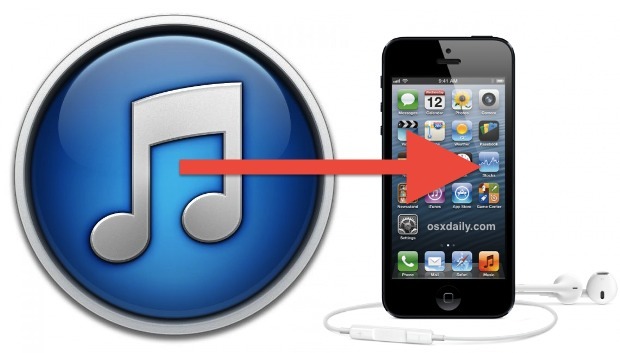 iTunes should then detect the iPhone/iPod through wireless and it will show up again in 20 seconds or so. Don’t use the “Eject” button though, that seems to keep it missing until it goes in and out of range. Same happens for me as it does for Petar. When I pull the connection my iPhone disappears from the sidebar but no, after 20 secs it doesn’t reappear. Never have been able to sync wirelesly in fact. Pretty sure iy’s an urban muth. Ghughes’s wifisync from Cydia worked brilliantly mind, inolden times. The only thing that doesn’t work for me is App updates; I have to download them on the iPhone as well as on my MacBook – one never updates the other. Is there a way of avoiding the double download? Agreed. Is there a solution? Nope, iphone not showing up for me either on same WiFi connection. There’s a step which is not explicitly stated, at least for my iPhone 5. I had to go to Settings>iTunes WiFi Sync to make the sync happen. Apparently, apps & photos are also sync’d at the same time – your post does not mention that. It appears that the sync will not happen automatically – i.e., that I have to decide to sync and go to the Settings to make it happen each time. Which is good, because it reminds me to plug the phone in so that the battery isn’t drained. I don’t plan to do manual syncs. Instead, I set up smart playlists, including some using the ratings, so that things I download or add to iTunes are automatically lined up for syncing to my iPhone. I should be able to curate the playlists whenever I’m on my iMac, and sync them wirelessly later. i’m using a new computer, (my music on my iphone was synched from an old computer) is there a way i can sync new songs onto my iphone from my new computer WITHOUT erasing the music that’s already on my iphone? I’ve lost my usb cable so I’m trying to figure out ways to sync without having to physically link my iphone to my pc. Can’t transfer single files. iTunes want to synch EVERYTHING. Settings match above. What am I missing? Thanks so much! Worked perfectly. I don’t know where I was not getting with the times on this one.